Making sure the emergent bilingual learners (EBLs) in your class receive the support they need can be challenging, particularly if they also require support for a specific learning need as indicated in an Individualized Education Plan (IEP). This resource is designed to help you in your work with and advocacy for students who need support in language development and have additional learning needs. The ideas and examples we will share in this resource draw on the expertise and years of experience of the CUNY-NYSIEB support team, whose members have guided dozens of schools across New York State to develop best practices for emergent bilingual students, including those with IEPs. We draw on our core principles in all the work we do, which view bilingualism as a resource in education and support a multilingual ecology for the whole school. Before we start, a quick note about language: If you are new to CUNY-NYSIEB’s work, you may be wondering why we refer to students as we do. 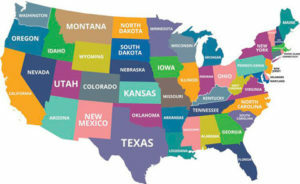 Labeling so often characterizes emergent bilinguals’ learning experiences in school: they are called ELLs (English Language Learners), and in the case of those IEPs, SWDs (Students with Disabilities) or SPEDs (Special Education Students), all terms that emphasize what they can’t do or the services they receive. We refer to these students as emergent bilinguals to emphasize their skills (bilingualism) and their growth potential (emergence). How do we get to know Emergent Bilinguals with IEPs? Emergent Bilinguals with Individualized Education Plans (EBL-IEPs) receive both mandated English as a New Language (ENL) support as well as services for a documented learning need under an IEP. We want to emphasize that these students are an incredibly diverse group in terms of language and cognition. Also, because students’ performances fluctuate over time, they can actually be “decertified” as they move through the school system (that is, they stop needing ENL or IEP services). Therefore, it is crucial to emphasize the talents, literacies, and intelligences of emergent bilinguals with IEPs, even as we acknowledge their particular needs. 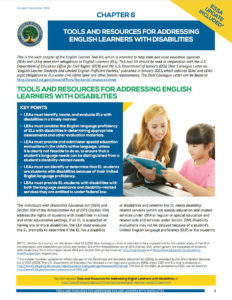 For more information on identifying, monitoring, and providing appropriate services for EBL-IEPs, check out Chapter 6 of the US Department of Education’s frequently-updated English Learner Toolkit. What can schools do for Emergent Bilinguals with IEPs? Typically, an emergent bilingual will be referred for evaluation for special education services if his or her ENL teacher realizes that the student needs additional help that is not a function of English Language acquisition. However, providing an accurate diagnosis for EBL-IEPs can be a challenge; it is widely documented that EBLs are both over- and under-identified for special education services (Brown & Campbell-Ault, 2015). Because evaluations for special education are normed on monolingual populations, they can give an inaccurate picture of an emergent bilingual student (Hart, 2009). In all contexts, evaluating students for special education services must be done with the family’s input and in a way that is culturally appropriate and recognizes the student’s bilingualism. For more identification and support, this resource page on addressing EBL-IEP’s linguistic and educational needs can help. 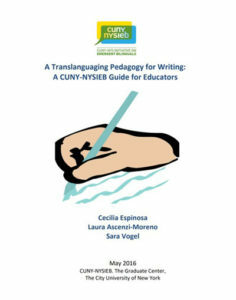 In CUNY-NYSIEB’s experience working with schools, a few strategies have stood out as particularly promising for emergent bilinguals with IEPs. We highlight classroom examples from cohort schools where these strategies have been successfully implemented. We present them here divided into “school based” and “classroom based” practices, to differentiate between what we have seen successfully implemented on a schoolwide level and what individual teachers have accomplished with these students. Emergent Bilinguals with IEPs receive two different types of support: they get help developing English for academic purposes, as well as assistance for physical, cognitive, or other reasons under a documented IEP. It is critical not to assume, however, that because these students are receiving so much support their needs are always being met. On the contrary, because these supports can mean separate classes or instructional periods, it is critical to ensure these students do not feel isolated from “mainstream” populations as a result. It is just as critical to ensure they are not stigmatized among their peers or held to lower expectations by their teachers. Having a whole school culture of high expectations and inclusivity is key to the success of these students, and the following strategies adhere to this philosophy. Families are key members of students’ support team. You can also tap into resources within your school community: bilingual staff members and parent volunteers can help in communicating with families, designing relevant curricula and resources, and conducting assessments in the home language. Once you have identified key community members as collaborators, an important next step is creating an understanding of what community is. Help community members understand the school-community relationship as reciprocal, that is, the ways we help each other and why we do so. This includes students and their family members in the broader community and ensures all members are on the same page when it comes to learning goals. Additionally, positive peer and adult relationships are supported, which helps establish behavioral norms for social situations and helps educators understand behaviors that may be culturally informed. Provide supports within the school community for family members who prefer communication in LOTEs: signage around the school, interpretation during IEP meetings, and access to bilingual education professionals to collaborate on IEP goals (Celic & Seltzer, 2012). During school sessions involving parents, incorporate Emergent Bilinguals with IEPs and encourage students to express their cultural and cognitive diversity by making positive affirmations about themselves and each other (Cheatham & Hart Barnett, 2016). The collaborative team approach is crucial when it comes to making instructional decisions about Emergent Bilinguals with IEPs. In this approach, educators work together with administrators, parents, and specialists to create a unified vision of support for student needs, teachers collaborate across disciplines, and all teachers receive Professional Development (PD) in accessible pedagogy. Collaborative decision making essentially extends the building community goal. Once you have established reciprocal relationships among all stakeholders, it is far easier to begin asking those involved with these students to help make decisions about their education. Additionally, this strategy asks all teachers – not just teachers of Emergent Bilinguals with IEPs – to become involved and join their community of support. Including special education teachers in PD about translanguaging and how it can help them supplement their existing inclusive pedagogy and further support their students. Ensure scheduling supports regular meeting and planning times across departments so special education and mainstream teachers have sufficient time to collaborate on learning goals for emergent bilingual students. At one cohort elementary school, a recent shift in enrollment had increased the numbers of emergent bilingual students, many of whom additionally received services under an IEP. Many teachers were unsure how to best serve the needs of their students. With the support of the CUNY-NYSIEB team and the principal, teachers formed a leadership team that involved all stakeholders: mainstream teachers, special education teachers, and ENL support specialists. Through regular meeting and dialogue, the team was able to learn and implement school-wide and classroom supports that all teachers agreed upon and were grounded in the principles of inclusion and bilingualism as a resource. As the year progressed, teachers were able to implement and then workshop strategies with their colleagues, in order to decide which interventions were the most useful to their students. At the end of the year, teacher provided the feedback to CUNY-NYSIEB support staff that they felt more competent in meeting the needs of their emergent bilingual students with IEPs, as well as had grown more skilled in seeing their colleagues as resources and partners. Moreover, the teachers felt empowered using the strategies, because they had all decided on using them together. Every student is an individual, with different learning needs, cultural and linguistic background, and talents. Thus, instruction for Emergent Bilinguals with IEPs needs to be accessible and leverage their diverse abilities and language practices. Moreover, when instruction is relevant to students, they and their families see learning experiences as valuable. Use culturally relevant texts and materials that are free from bias in portraying people from diverse groups (García & Tyler, 2010, p. 114; Ebe, 2011; Celic & Seltzer, 2012, pp. 13-19). To determine whether the materials you currently use with EBL-IEP students are relevant to them, you can use a cultural relevance rubric. Your students and their families can help you with this evaluation! One big way you can support students is by opening up your classroom to translanguaging. The principles of inclusive education are all about removing barriers to participation so that all groups and individuals can have access to high quality education. Because translanguaging affirms students’ diverse language practices and uses them as a resource in education, translanguaging does this for emergent bilingual students. That makes it a natural fit in a special education context! When special educators plan supports and scaffolds for their students, they always keep in mind the idea that students learn through different modalities. When we look at students’ language repertoires through this lens, we see the need to include multiple means of representation, expression, and engagement in our lessons. The ideas we present below explain how translanguaging can help create a more inclusive environment for Emergent Bilinguals with IEPs. These strategies also fit in very well across the Universal Design for Learning (UDL) framework and are aligned to UDL principles of teaching and learning. For more translanguaging strategies, click on the Guide above! We must appreciate that Emergent Bilinguals with IEPs arrive in classrooms with considerable prior learning. This can help us design learning experiences that welcome and build on what students know, as well as intentionally teaching specific, relevant knowledge and skills that they need in order to access new content and tasks. This can be done by providing materials and using instructional tools that give multilingual options for students to receive new information. 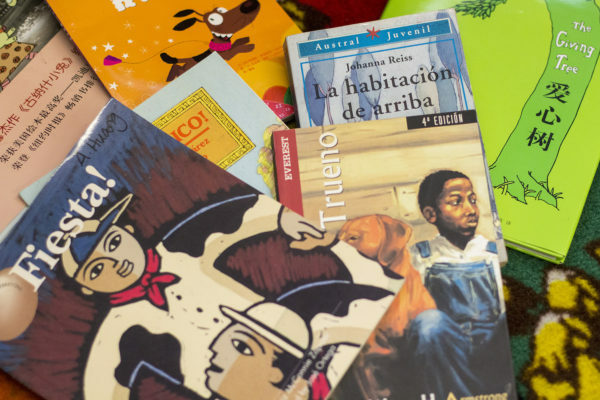 Many curricular materials are English-only, and particularly in the case of these students, materials in the home language can provide an additional academic support. In an 8th grade integrated team teaching English Language Arts class, the teacher team planned to introduce their students to the idea of “taking a stand,” a key theme in the unit they were starting that featured “To Kill a Mockingbird” as the class novel. Knowing the dense novel would be a challenge to their students, many of whom receive language and special education services, the teachers wanted to provide a low-stakes, high-interest entry point to engage their students in thinking about the book from the get go. They set up a multilingual and multicultural “gallery walk” of images and signage that represented individuals and groups from the students’ linguistic and cultural communities “taking a stand” on important issues. Students rotated around the room with language partners, and had a “silent conversation” in English and the home language about what they saw. In a “silent conversation,” students respond to each other in writing – in the case of this class, the teachers provided prompts in English and the home languages of the class to scaffold students’ responses and teach them the language of building and questioning. After the activity, students read the posters together in mixed language groups, using each other as resources to make sense of the multilingual responses. They had meaningful conversations around what the images mean to them, as well as generated questions about what they might mean in connection to the unit they were starting. The teachers noticed that when students used their background knowledge (cultural context of the photographs) and home languages, students were able to successfully understand and engage in the activity and generate meaningful conversation and writing in English afterward. Students should be invited to demonstrate their learning using multiple modes and languages, including on assessments. When it comes to sharing what they know and have learned, the language students use is not critical unless that is what is being assessed. What does this mean? If you want students to demonstrate how well they have mastered writing a well-organized paragraph in English, the final product (the assessment or completed task) should be in English. However, if you are assessing how much they have learned about the life cycle of a butterfly and they are able to use gestures, home language, pantomime, or other modes to express this concept, it can be accepted as a completed task. Students can learn to monitor and support their own learning. You can support students in doing this by teaching them ways to develop executive functioning mechanisms such as reflection and self monitoring so they can learn to adjust their actions in ways that support their own learning. Provide exit tickets/other “check in” activities in both languages (Celic & Seltzer, 2012). A 6th grade Special Education teacher in an urban public school had a class of 12 students, some of whom were Emergent Bilinguals with IEPs with Haitian Creole, Bengali, Fulani, Arabic, and French as their home languages. The teacher asked the students to write 3-5 sentence narratives that described their daily lives. The teacher posted sentence stems such as, “On Saturdays, I like to …” and “My favorite food is … “ The whole group listed different foods in English and in the students’ home languages on the board and created a multilingual chart of terms. Afterward, students used the sentence starters to complete at least one sentence in English. The teacher further aided students’ multi-literacy skills by having students write sentences in their home languages as well. Those who could explain more were challenged to write two or three sentences, but everyone was able to complete some type of authentic writing that served a real purpose and audience, and where students were able to make choices about topics and express their own voices. Even the most hesitant speakers were proud to share. Juan is a 7-year-old student who arrived to the U.S. from Puerto Rico as a toddler. He speaks Spanish as a home language, and has been receiving ENL services since entering Kindergarten, and is additionally classified with another health impairment (OHI). His class is a bilingual, co-teaching model, where his two teachers – the general education bilingual teacher and the special education teacher – work in consultation with the ENL teacher. Juan also receives pull-out resource room services to address his IEP goals in Spanish. Through the bilingual instruction in his classroom, Juan is developing good verbal English expressive and receptive abilities in addition to developing literacy skills in Spanish. He is below grade level in reading and writing in both languages, but is learning quickly and is really excited by his schoolwork. Juan experiences academic successes when given the opportunity to express his learning in different ways. For instance, he likes to use a reading “app” on the classroom iPads to demonstrate his developing mastery of English phonics. He also benefits from reading texts in context and discussing them with his peers: On a recent class trip to the zoo, for instance, reading English and Spanish texts about the animals and talking about them with his peers helped him complete a detailed writing assignment about the trip. However, Juan also faces some barriers to consistent success. The students in his class, half of whom receive one form of supplemental educational service or another, have a great deal of individual needs and Juan sometimes gets distracted or struggles when a teacher is assisting another student. Another challenge has been the medication Juan takes for his diagnosed Attention Deficit Hyperactivity Disorder (ADHD). His doctors and parents are working to regulate the dosage, because when his medication is off, Juan is either lethargic or disruptive. Héctor is a 14-year old student originally from Panama who came to the U.S. in first grade. Since coming to the US he has been in three schools, in three different states. Perhaps as a result of this inconsistency in schooling, Héctor was not identified as an EBL until 6th grade. In addition to the EBL label, he also receives services for a classified learning disability under an IEP. Héctor is placed in a general education classroom with pull-out ENL services and Special Education Teacher Support Services (SETSS). Héctor is charming, likeable, and very social. While quiet in his classes, he likes to exchange secret messages or gestures with his peers. He loves basketball and plays for the school team. He seems to be well-integrated among his peers, although he can appear shy among adults. Where he thrives socially, Héctor’s relationship with academics is more complex, particularly in regard to language use. At home with his family, Héctor only uses Spanish. However, at school he only uses English. When other Spanish-English bilingual classmates communicate in both English and Spanish among themselves, Héctor does not participate. He doesn’t feel comfortable providing Spanish translation to newcomer students who don’t speak English and doesn’t like to say that he was born in Panama. Also, though he can speak and understand Spanish he does not read or write it, possessing literacy skills in English only. Héctor has been experiencing some academic successes recently, leading to notable improvements in his reading and writing proficiency in English (though he is still at below grade-level expectations). Héctor’s teachers had been noticing he is often hesitant to begin a written task and is forgetful of steps, so this year they began supporting him with sentence starters and writing models. These graphic organizers have been helpful in teaching Héctor to structure his writing. When reminded of steps and presented with models, Héctor can now produce independent writing that fulfills the requirements of the task. Another area of strength is that he responds well to feedback from both his teachers and his peers. Valentina, 17, 11th Grade Student from the U.S.
Valentina is a 17-year old student born in the U.S. of Mexican descent. She has been receiving ENL services for 11 consecutive years, so is classified as a Long Term English Language Learner. She also receives services under an IEP because of a classified learning disability. Valentina is in 11th grade at a high school in a large urban area, and receives language and special education services through integrated co-teaching with two or more teachers (general education, special education, and/or ENL teachers) in different subjects. Valentina loves cooking and drawing, is social and polite, and gets along well with her peers. Valentina speaks both English and Spanish at home. She has strong Spanish literacy skills, having participated in one-way dual language programs as an elementary school student and “Spanish for Native Speakers” classes through middle and into high school, yet she prefers to speak and write in English. She demonstrates strong comprehension of written texts and the ability to retell or paraphrase what she has read. She is also a talented creative writer who enjoys crafting imaginative narratives and poetry. Some areas of difficulty for Valentina include organization and applying appropriate mechanics in her writing. Specifically, she is inconsistent with distinguishing claims from counterclaims and using transitions to connect body paragraphs with claims. She also often has challenges remaining on task. Successful strategies her teachers have tried include giving her question prompts, using graphic organizers, applying annotation routines, and providing redirection. When her teacher gives her prompting with questions, Valentina can recognize and implement corrections on her own most of the time. For organization, her teacher has used T-charts to help her organize ideas for an essay and provided a pre-filled organizer for her to insert relevant information. Learning an annotation routine has also helped Valentina to improve her reading comprehension. Valentina is now able to apply the routine without prompting, and this has improved her overall proficiency in literacy-based skills. Cheatham, G. A. & Hart Barnett, J.E. (2016). Overcoming common misunderstandings about students with disabilities who are English language learners. Intervention in School and Clinic, 1-6. García, S. & Tyler, B. (2010). Meeting the needs of English language learners with learning disabilities in the general curriculum. Theory Into Practice, 49(2), 113-120. Hart, J. E. (2009). Strategies for culturally and linguistically diverse students with special needs. Preventing School Failure: Alternative Education for Children and Youth, 53(3), 197-208. 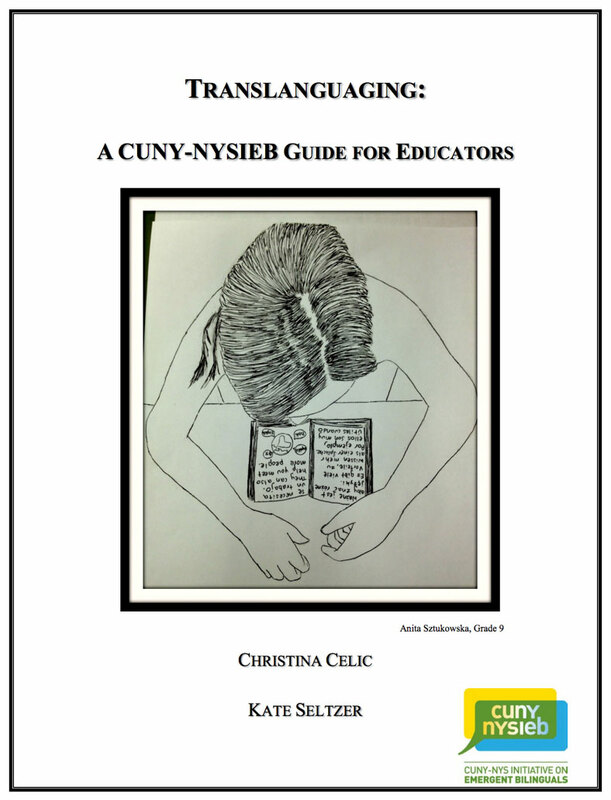 This CUNY-NYSIEB resource was created by Kathryn Fangsrud Carpenter, Kahdeidra Martin, and Louis Olander. María Cioè-Peña, Maite Sánchez and Kate Seltzer served as advisors to the authors. We would like to give special thanks to the teachers and administrators who provided feedback on this resource.